This concentrated powder can easily be added to a toddler’s bottled formula or juice, smoothies and yogurt. It contains Bifidobacterium infantis, one of the most important microorganisms found in the large intestine of toddlers. This formula elevates low levels of B. infantis in gut microflora due to caesarian birth or lack of breastfeeding. Suitable for children over 12 months of age. This product has come into contact with milk and soy lecithin. Do not use this product if you have a milk or soy allergy. Discontinue use and consult a health care practitioner if symptoms of digestive upset (e.g. diarrhea) occur, worsen, or persist beyond 3 days. Keep out of reach of children. Keep bottle refrigerated. Love this product, have reordered it and will continue to reorder it- dissolves pretty well. Son can't detect it. We love using this with my daughter! She's been taking it since about 6 months old and hardly ever gets sick. Such a great product!! Good product only downside you really have to mix it. I was stirring it into my toddler's glass of milk and it would sometimes leave residue/clumps at bottom as it wouldn't fully dissolve. Possibly stirring it into applesauce or yogurt might be a better option. 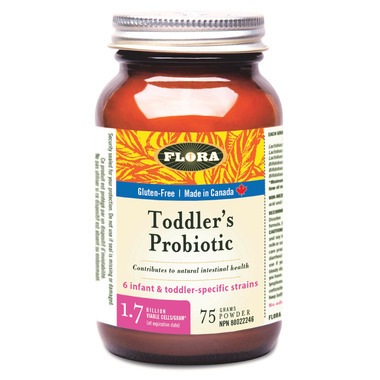 Great product that I believe helps to keep my little ones healthy, even when exposed to the various germs/colds that kids are constantly faced with. Great, but I find the powder difficult to use and would rather spend a little more to get the chewable tablets. Great product! I find it very effective for my kids.